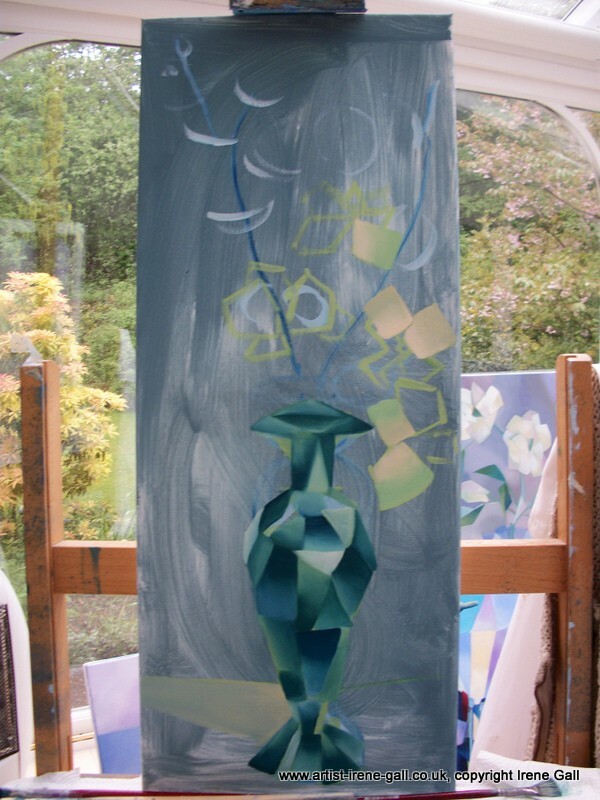 A narrow canvas seemed suited to a painting of magnolias in a copper vase, depicted in a geometric manner. Unusual vases, often from charity shops make an interesting display vehicle for lovely magnolia blossom. 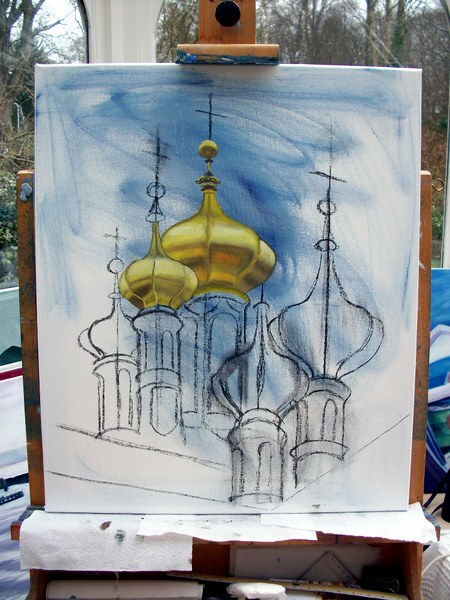 I have always loved onion domes. When I visited Russia away back in the 1970's, they had been neglected, but the Soviet authorities were beginning to value them and have them regilded. Visits to eastern Europe in 2012 and 2011 reminded me of how splendid they are. 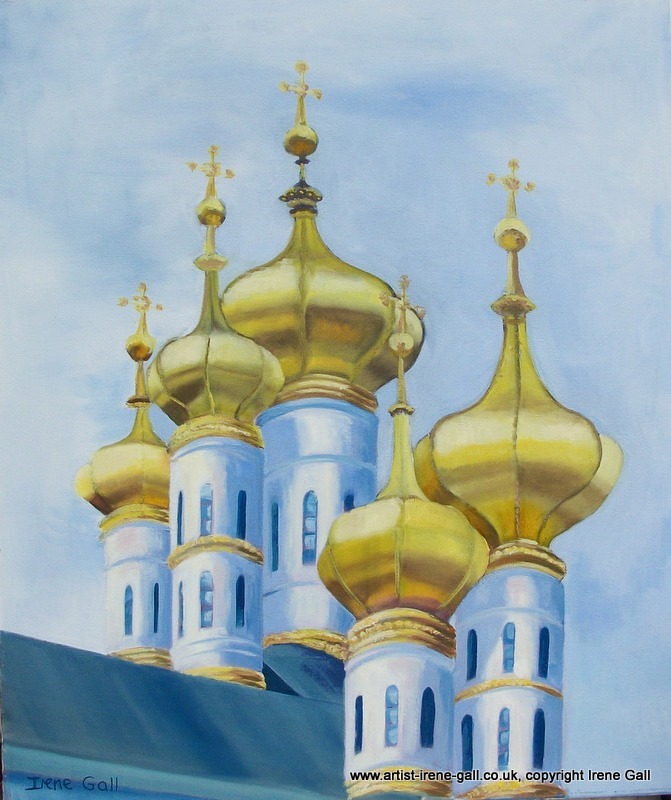 This is my second painting featuring gilded domes. Here, the magic of paint is creating the gold shapes from the charcoal outlines. 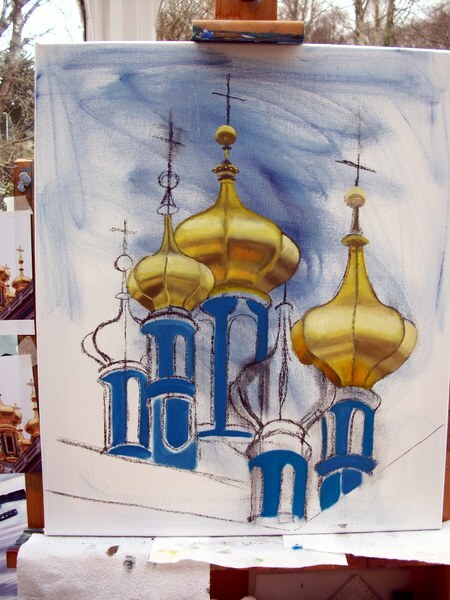 This is 'Gold Domes in St. Petersburg'. 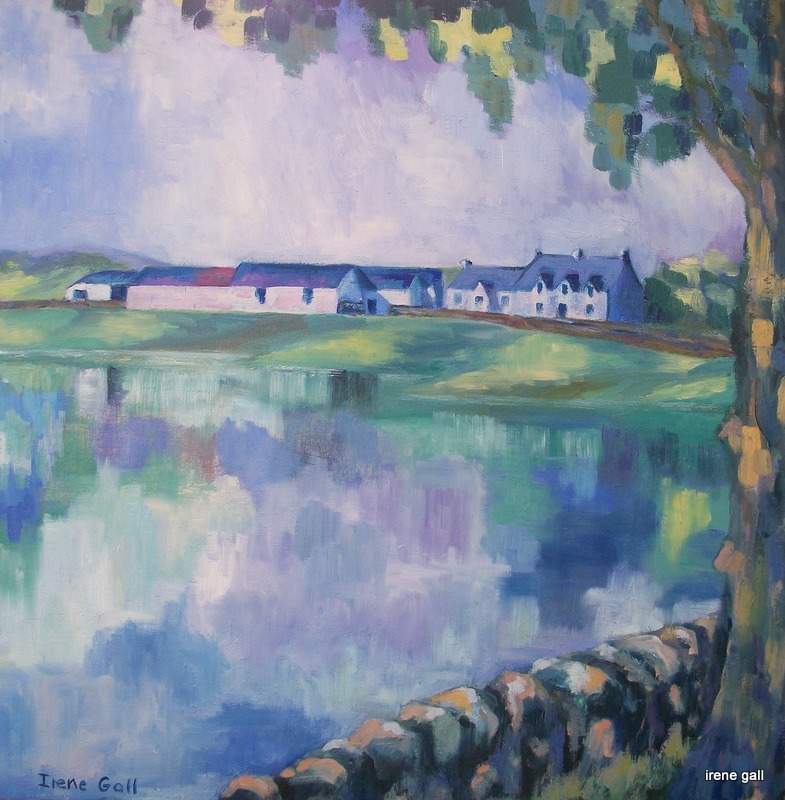 This is a painting of Lakehead Farm, Closeburn, as it appeared in the 1960's. I lived next to the farm and this view is from the school playground of Wallace Hall Academy, as it was then. The name tells us there was once a lake here, which was drained, but every winter the front field would flood to reform part of the lake and if we were really lucky, swans would appear for a week or two. I worked from memory and old photographs (courtesy of Shona Walker, many thanks Shona!) to recreate the scene. The dyke in front and the tree were part of the school playground. The painting is oil on canvas, 24" x 24". 'Sailing into a Storm'. 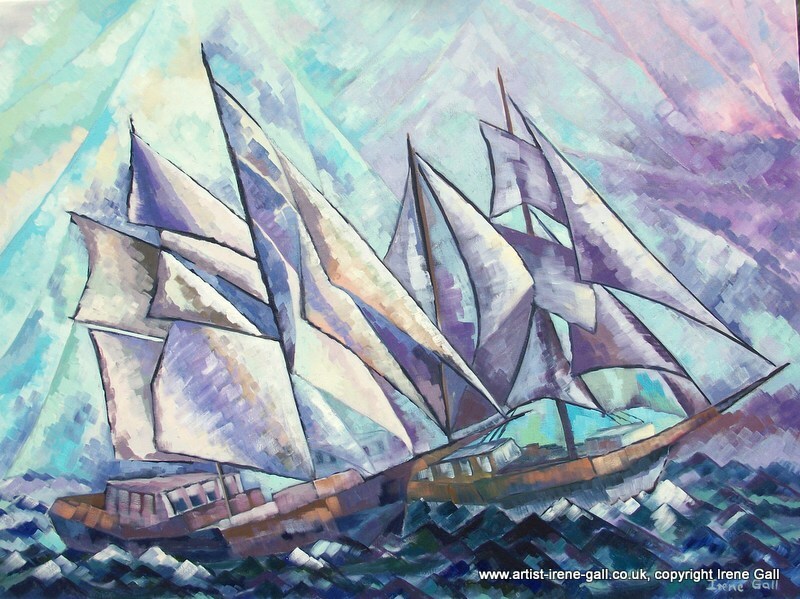 I have enjoyed drawing and painting tall ships since I was a child. A few years ago, we drove into St Malo - oblivious to notices in French telling us to park some distance away - found a parking space on the quay and happened on a collection of tall ships anchored in the harbour. Here, I have painted ships, from imagination, in a style I enjoy. Both the Italian Futurists and Feininger in Germany had adapted the Cubist style to incorporate impressionistic brush strokes - and that is the style I have used here. It shows movement and speed very well, and allows a freedom of expression within the Cubist-influenced shapes of the painting. 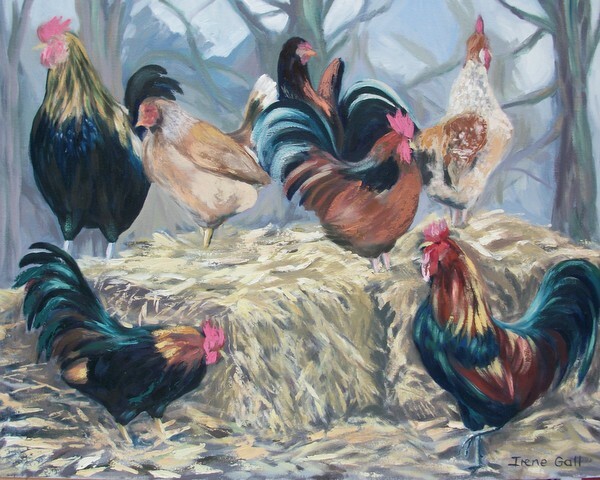 The painting measures 1 metre x 76 cm. Here are two new paintings, 'Boats in the Harbour, Puerto Mogan' (91 cm x 24 cm) and 'Chickens on a Hay Bale' (76 cm x 60 cm). They are both oil on canvas. The boats were seen in Gran Canaria. Returned from a fishing trip, there were ropes and crates and tackle boxes in the boats. Expensive engines were covered in old cloth. 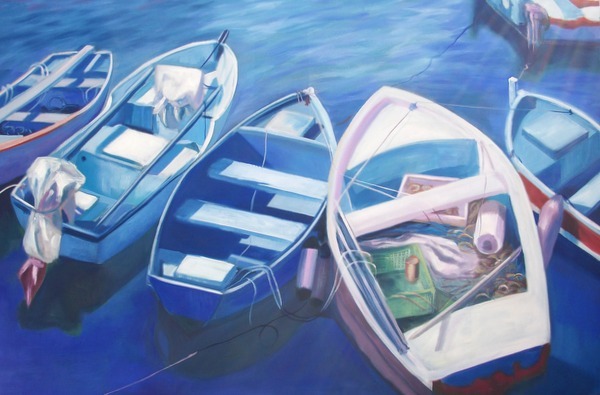 This painting just shouts summer in the sunshine, so you can see why I painted it this winter!